I’ve treated myself to a beautiful Mooshimeter. Not that I didn’t have enough multimeters already. No I love the idea of the Mooshimeter. And on top of that it can measure 2 channels simultaneously, enabling me to measure things I couldn’t measure before with a multimeter, like for instance real power, apparent power and power factor. While playing with the Mooshimeter to see what it is capable of I discovered some bugs and limitations. Fortunately the Mooshimeter is mainly software and I hope these bugs can be solved in the near future. At first I wanted to show some use cases of the Mooshimeter here. But once I started finding bugs here and there it turned out to be a review instead. The Mooshimeter comes in a nice case, which holds 3 probes and 3 alligator clips, which can be attached to the probes Oh, and the Mooshimeter itself of course. What am I supposed to do with these? Lose them? 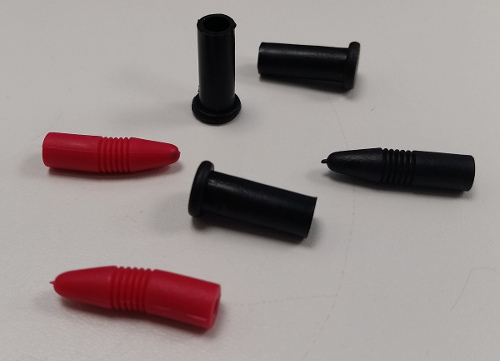 By the way, the probe tips and the shrouded banana plugs are capped with protective plastic caps and plugs. Why? OK, the protection on the sharp tips I might understand. But where to put them when you’re out in the field trying to measure something. I bet I’ll lose them in no time, so I threw them in the bin. That way I can no longer lose them. But what is the use of the black plugs in the shrouded banana plugs? Somewhere in the world there is a machine producing these things and probably a person inserting them into the shrouded plugs. And the first thing I do, and probably everybody else, is to take them out and throw them away. Sorry, this is off topic and has nothing to do with the Mooshimeter itself. I just got carried away. The Mooshimeter arrives in Shipping Mode. This means that its radio is switched of. You take the meter out of shipping mode by shorting the Common and Ω inputs together for about 10 seconds. You’ll have to install the Mooshimeter App on your phone or tablet. I use Android, so my review here describes the Android App only. I don’t expect the IOS App to be much different though. When you start the App it will scan for nearby Mooshimeters. Select yours, which is not difficult if you have only one, and you should be good to go. Apparently the firmware of the Mooshimeter is constantly updated, my Mooshimeter came with an old version. The App detected that and immediately started updating the meter’s firmware. This process went flawlessly. However it was a bit confusing, to me. After uploading of the firmware it said that the firmware was to be flashed into the Mooshimeter. After that the meter rebooted, which is also something which is to be expected. But after that the screen still said that the firmware was old and needed to be updated. And when I pressed the update button again it said that the programming was aborted. Perhaps flashing the firmware takes a while, which is cancelled when you press the upload button again. So I expect you should give your Mooshimeter some time to update. I can understand that it’s difficult because you’re too excited to start using your new toy. I don’t remember exactly what I have done, but eventually the update finished and my Mooshimeter now says that its firmware is up to date. Oops, I have opened my Mooshimeter, is my warranty void now? I particularly like one of the less obvious things about the Mooshimeter. Where other manufacturers discourage you to open their, sorry your, equipment by putting "warranty void when removed" stickers on strategic locations, the Mooshimeter has to be opened by you. For changing of the batteries, or to replace the fuse, or to insert an SD card for instance. Why shouldn’t I be allowed to open equipment I have paid for anyway? For this review, which was written at the very end of January 2017, the firmware version in my Mooshimeter was 1477971088. And the App version was 1.0.33 (2097). Issues I have found may have been rectified with newer versions. By the way, all measurements in this review are done with the sample rate and number of samples in the Auto position. There are two different settings screens. One will appear when you press the gear icon in the upper right hand corner of the Scan menu The other one will appear when you press the gear icon in the upper right hand corner of the meter display. 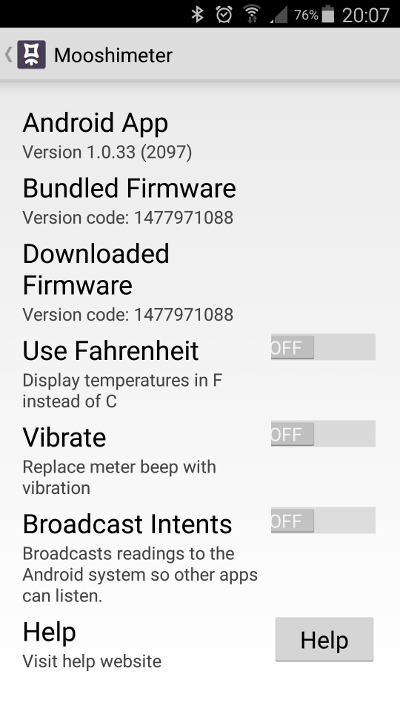 In the scan setup menu you can see the current firmware versions, set the temperature unit, the beep or vibrate option, the broadcast option and get Help. The help button will simply send you to the https://moosh.im/support web site. Here you can tune various settings to your liking. Personally I like the Autoconnect function best. Now you simply start the App and your own Mooshimeter is automatically connected. In the settings you can also set the Mooshimeter to Shipping mode again. A nice feature if you want to take your meter on an airplane for instance. The Mooshimeter is not a conventional DMM. It doesn’t have that many ranges, it relies heavily on the enormous resolution of its 24-bit A/D converter to cover the entire span of its input ranges. It appears there are only 2 ranges: 60V and 600V full scale. The imput impedance on both ranges is 10MΩ. I have seen documents claiming that the Mooshimeter has a third range of 1.2V full scale, with a floating input, but I couldn’t find evidence of that on my Mooshimeter. Update: It appears that this range did exists but was cancelled because it was too noisy to be useful. I expect that this input has only one physical range, which is 1.2V full scale. The App says there are 3 ranges though. But whether they are real hardware ranges or simply software simulated ranges is unclear to me. Anyway, on all 3 App ranges I have measured a constant input resistance of 2.7GΩ, which is nearly floating. Clearly there is only one current range, which is 10A full scale. The current is measured across a 0.01mΩ shunt resistor. This means that you can’t expect too much accuracy in the lower current regions. I’ve seen 3 different drive currents to measure resistance, so I expect that there are 3 physical ranges. The App shows 5 though: 1kΩ, 10kΩ, 100kΩ, 1MΩ and 10MΩ. According to the Mooshi web site there should also be a frequency counter. But if there is one, they’ve hidden it well, because I can’t find it anywhere in the menu. Not that the frequency counter is that interesting as it will only count up to 1kHz. First of all remember that accuracy is not the same as resolution. The basic accuracy of the Mooshimeter is better than 0.5% on DC voltage and current ranges. While it is better than 1% on AC and resistance ranges. Usually this accuracy is valid for values near the full scale of the selected range. Therefore the accuracy gets worse when the measured values get further away from the full scale. Combine this with the few ranges of the Mooshimeter and you should understand that the Mooshimeter is not likely to be a very high precision instrument. Knowing this in advance I was pleasantly surprised by the accuracy of my Mooshimeter though. The resolution, on the other hand, is ridiculously high for a meter with these modest specs. Please remember that only the 3 most significant digits shall be reasonably accurate at full scale. While all remaining digits can only be used to see trends, relative to previous measurements taken by the same channel. Don’t expect to see exactly the same values when you apply the same voltage to both voltage inputs for instance. Having so many digits may be nice to see trends. You can easily see at what rate a value increases or decreases. However you can expect at least the 2 least significant digits to jump around quite nervously, even with a very stable input signal. This can frustrate the accurate reading of the values. Therefore it would be nice if the App is changed so the user can select a custom resolution. I have compared the DC voltage measurements of the Mooshimeter to a 6½ digit DMM. First I tried a low voltage, which could be measured by both the main and auxiliary inputs. For this I used the output of a Fluke DMM in Ohms range as voltage source, which is quite a stable voltage source. 2.8990V 211.2746V What the ….? 1044.906mV What the ….? 2.8990 2.89821V -0.03% N.C. N.C.
2.8990 N.C. N.C. 1044.900mV Say what? I beg your pardon! When you overload the Aux input the meter suddenly goes haywire. 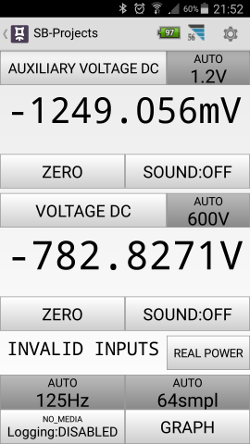 Clearly 2.899V is too high for a 1.2V full range input. But it should tell you so, not show erratic values. And what about the main channel? In the third line the main channel only had 2.8990V applied to it, just like the Aux input. And it says that the input voltage is 211V! Even if I only apply 2.8990V to the Aux input and leave the main input open it shows 209V on the main channel. If I reverse the 2.8990V on the Aux channel the Aux value constantly jumped between some -191mV and -344mV, instead of showing OUT OF RANGE. Totally unacceptable if you ask me. If you slowly increase the voltage on the Auxiliary input above 1.5V the meter will show OUT OF RANGE first, as it should do. And then, as the input voltage increases above 2V the unconnected Main channel starts to show erratic values which get higher as the voltage on the auxiliary input rises. And once the input voltage reaches some 2.4V the OUT OF RANGE message on the Auxiliary channel disappears and values between 1000 and 1100mV are shown, while the voltage shown by the main channel is at 164V. Lowering the voltage slowly again will not show the OUT OF RANGE message again until the voltage drops below 2.25V, or there abouts. Once the input voltage on the Aux input reaches 8.1V the Main channel shows OUT OF RANGE, while the Auxiliary channel shows a meaningless 869.192mV. By the way the Aux input maxes out at 1.58V, on a 1.2V range! And it is quite accurate as well, however I would have expected an OUT OF RANGE message above 1.2V on a 1.2V scale. Reversing the voltage on the Aux input has other peculiarities. Once the voltage on the Aux input raises above -1.208V the display freezes at -1208.210mV. This stays like this until the voltage on the Aux input rises above -2.4V (or should I say drops below -2.4V? I would say rise, because you can get a very nasty shock from a very low voltage of -2000V I guess.). From then on the meter shows an erratic positive voltage. At -2.6V it flashes between -259mV and OUT OF RANGE. If I increase the negative voltage further the OUT OF RANGE flashing stops again. In the meantime the Main channels shows an increasing high negative voltage, it goes OUT OF RANGE at -7.2V. Lowering the voltage to -1.100V for instance doesn't restore proper operation automatically. The Aux channel shows -157.438mV, while the unconnected Main channel shows -1.09589V. Normal operation is only restored after I have lowered the voltage to -1V. Wait a minute, I'm on Auto range, and the range is now 300mV, while I apply -1.1V. Hmmmm, setting the range manually to 1.2V doesn't help. When I set it manually to 1.2V the Aux display shows -076.090mV, while -1.1V is applied. So it's not just the simple fact that the meter selects the wrong range. Update: A very reliable source (Mr. Mooshi himself) explained to me what is happening here. I won't repeat here what he told me, I don't know if it is confidential or not. But it boils down to this: If you overload the Aux input the protection circuit starts sourcing or sinking current, depending on the polarity of the input signal. Therefore the reference voltage starts to drop or rise, resulting in erratic behaviour of the Main channel. As this is a hardware related issue it can't be fixed by a firmware update. However I sincerely hope that the firmware can be updated to show OUT OF RANGE, or any other appropriate message when a thing like this is happening. As a user I don't expect the Main channel to show erratic values when I overload the Aux input. I have also tried the high voltage range. For that I connected two 60V power supplies in series to get approximately 120V. The reference meter showed a fairly stable 120.7023V, while the Mooshimeter showed 120.6633V ±0.0010V. When reversing the polarity the Mooshimeter showed -12.6643V. Both values are only -0.03% off compared to the reference DMM, very nice. The Mooshimeter uses an unconventional way to measure AC voltages (and currents). Normally a precision rectifier is used to convert the AC voltage to a DC voltage before it is applied to the A/D converter. More sophisticated multimeters use a True RMS converter, which accurately converts even non sinusoidal input voltages to their RMS DC values. The Mooshimeter on the other hand simply samples the input voltage at a high rate (typically at 4000Hz) and then calculates the RMS value of the input signal from these samples. This results in a circuit with less components, which results in a smaller and cheaper meter. I think it’s a clever idea. However I have found a few issues, which hopefully can be rectified in an upcoming firmware update. As I said a meter’s accuracy is specified at full scale. The lowest scale on the Mooshimeter's Main channel is 60V, which is supposed to have a better than 1% accuracy. I think it is quite impressive that I get an accuracy of -0.2% with a 100mV input signal on a 60V scale! This could have been a lot worse. With 700mV at 50Hz the value is well below the expected accuracy, while it’s still not even near the full scale value. However the Mooshimeter shouldn’t be used to measure voltages other than those around the mains frequency. At 400Hz for instance the meter doesn’t perform that good anymore. The meter performs reasonably well with non sinusoidal input signals around the mains frequency too. I have found a document saying that all AC measurements assume a sinusoidal input signal with a crest factor of √2 (The ratio between the peak value of the signal and its RMS value). However my Mooshimeter didn’t perform too bad on measuring triangular and square waves either. I have also noticed a strange phenomenon when I apply a very low voltage. I’ve made a video of that too. The voltage applied is 50mV @ 50Hz. With this signal the Mooshimeter constantly walks up and down between 49.8mV and 50.2mV, as you can see in the video. Would this be caused by aliasing perhaps, or the lack of common mode rejection? Or would it simply be a matter of exaggerated resolution? After all the full range is 60V, so I’m not reading 0.0500V, I’m reading 00.0500V, which is 6 digits on a 1% accurate instrument! 1% of 60V is 0.6V, everything below that is only to be treated relatively. The Aux channel suffers from the same overload issues on AC as it does on DC. However because the peak value of a sine wave is ±√2 times the RMS value the full scale value for AC is specified to only 700mV RMS. Values above that level will again cause the reference voltage to rise or fall, resulting in totally erratic values displayed on the Main channel. I hope a software fix will be able to warn the user about this condition properly. Another thing I noticed is that the AC voltage measurements are not purely AC, which applies to both the Main and the Auxiliary channel. Normally a capacitor is used to block DC voltages from the input signal in a DMM. But because the Mooshimeter does AC measurements in software there is no input capacitor. So what happens if you apply an AC signal which contains a DC offset? Well the measurement gets more and more erratic when the offset increases, either positive or negative. For instance when I apply 1.000V @ 50Hz with a DC offset of 1V to the Main channel, the reading of the display jumps up and down between 1.32 something and 1.40 something (1.4142V would be correct). And when I increase the offset to 2V the meter suddenly shows a steady 0.0000V. In case you’re wondering what the threshold is, at a 1.424V offset the meter suddenly shows 0.0000V, instead of the erratic values which it showed below that threshold. Is that a coincidence that it is this close to √2? Perhaps not. Anyway, once you start adding an offset it becomes very difficult to get a proper reading because of the nervousness of the display. Let alone whether the reading would be accurate if you could read it. And when the offset gets too high, which is fairly quick, the meter suddenly shows 0V. Update: From the above mentioned very reliable source I've learned that the Mooshimeter uses the zero crossing of the signal to start and stop sampling in order to avoid a phenomenon which is called aliasing. And if you rise a sine wave with an peak amplitude of √2 (or 1V RMS) some 1.42V above ground it won't cross the zero line any longer. Hence the meter doesn't know where to start sampling anymore. That's why it reads 0. Clearly the firmware needs some improvements here. Perhaps it would be better to start and stop sampling on the signal's peak. There's always going to be a peak level, no matter what offset is used. And if the software is capable of detecting both the positive and negative peaks, it can subtract the DC offset all together. However this won't work very well with small signals and a huge offset I suppose. While doing the AC measurements I have witnessed several occasions where both displays froze up for a few seconds after which the Mooshimeter rebooted itself. And when it came back the meter was reset to the default DC current and DC voltage functions. I haven't seen this happen on any of the other functions. So my guess is that there is a bug in the firmware in AC mode somewhere which fails to keep the watchdog happy. Basically there’s only one current range, for the rest the meter relies on its phenomenal resolution. At least there’s only one current range with a built in current shunt. You could use an external current shunt and measure the voltage across that with the Auxiliary channel. It's also possible to use an external current clamp, connected to the Auxiliary channel. I will only use the internal reference now. I will compare the Mooshimeter to the 6½ reference DMM again. Clearly the Mooshimeter is not an expert in low currents. At least it is not with the built in current shunt. I have noticed a slight drop in the displayed current at 10A for the first minute or so. This might be caused by the increase in temperature of the current shunt. This drop was approximately 2mA though, well within the specs of the meter. The burden voltage at 10A was 247mV, which is slightly higher than mentioned in the specs. Please note that the quality of the fuse plays a large role in the burden voltage. Make sure you always use the original fuse! The only way I could measure this was by measuring the current flowing through an incandescent light bulb, while regulating the voltage across the lamp. Since the mains voltage is never very stable the comparison will not be that accurate. And since I only had a simple 100W bulb as a load the current range I could test was also limited. Not bad, considering the primitive test setup I’ve used. I didn’t test the DC power measurement. I trust the Mooshimeter can multiply two values together. Calculating the power of AC signals is bit more complicated for the Mooshimeter because it’ll have to take the phase shift between voltage and current into consideration, and I was curious to see how the Mooshimeter performed here. For this measurement I measured a simple 100W light bulb and took several screen shots at different voltages. That is way easier than writing down the numbers by hand from 3 different nervously jumping displays. I can only guess why especially the 79.71W is out by -0.4%. Perhaps the displays are updated asynchronously, which means that the voltage, current and power readings don’t necessarily are from the same sample point. The apparent power was always equal to the real power. And the power factor remained 1.00 all the time. Which is to be expected from a pure resistive load of course. While measuring AC power you should be aware that the voltage measurement is done with reference to the C input terminal. Therefore the C terminal should be Common to the voltage and the Current measurements. Reversing the C and A inputs results in negative real powers to be displayed and the power factor should be multiplied by -1. This is as expected as the current is now 180° rotated in phase with respect to the voltage phase. However when you’re measuring DC powers at very low voltages you might deliberately swap the A and C input terminals. Otherwise the load will receive the measured voltage minus the burden voltage across the Mooshimeter’s shunt. And at for instance 3.3V input voltage a burden voltage of 0.2V will introduce quite a large measuring error. Alas I don’t have a proper inductive or capacitive load at hand on my work desk in order to be able to check the apparent power and power factor calculations correctly. I have switched some 0.33µF capacitors in parallel and put those in series with a 60W light bulb. The values shown by the meter compared rather well to the values I’ve entered on a power factor calculator web site. The values I’ve measured were rather low, so I’m not going to take the outcome of this measurement very seriously. But what I’ve seen gives me confidence that they’ve got this measurement under control. Clearly the 1Ω and 10Ω values are way out of spec. But this is to be expected of these low values. Lead and clamp resistances have to be taken into consideration too. All the other values are well within the 1% allowed tolerance. However I should note that especially the 1MΩ and the 10MΩ ranges were a bit noisy. It was very difficult to read the 2 least significant digits as they were constantly jumping up and down. I simply guesstimated the average value of these 2 digits. That’s what you get with these ridiculously high resolutions. Luckily the values jump around on the least significant digits only here. Suppose their values jumped between 9.99985 and 10.00010. That would make it very difficult to find a reasonable average value. Just like any other multimeter the Mooshimeter sends some current through a diode and measures the voltage across it. Nothing special here. The open voltage is some 1.8V, but varies, depending on the state of your batteries. This does limit the usefulness of the Mooshimeter if you want to determine the polarity of LEDs. It can only detect the polarity of low power Red LEDs and Infrared LEDs, which usually have forward voltages lower than 1.5V. The Mooshimeter can read its own internal temperature. I have no idea where the internal temperature sensor is located. Since it’s locked inside in a sealed box you would expect a considerable lag between external and internal temperature changes. For this test I attached a K-type thermocouple into the C socket of the Mooshimeter as reference temperature and put the meter in a freezer. The starting temperature was +18°C. I was much surprised to see that the temperature indicated by the Mooshimeter was following the reference thermometer downwards within 0.2°C for the first couple of minutes. However after about 10 minutes the reference thermometer got about 4°C ahead of the Mooshimeter for quite some time. Towards the end of the downward slope of the temperature they came closer together again. Anyway, it took the Mooshimeter about 15 to 20 minutes longer to reach the end temperature of -16°C than the reference thermometer. It took the Mooshimeter 90 minutes to get from +18°C to -16°C. The difference between the Mooshimeter’s reading and that of the reference thermometer was only -0.2°C at -16°C, which is pretty cool! (pun intended). By the way the reception was still very good when the Mooshimeter was stuck inside the freezer. I could easily be 5m away from the freezer and still receive meter updates. I knew I had seen it somewhere that the Mooshimeter could measure temperatures through a K-Type thermocouple. But I couldn’t find it in my App. Until I browsed through the Power menu. A strange place to put a temperature function. Surely you can't measure voltage, current and temperature all at the same time. You can't connect a thermocouple to the same terminal which is carrying a large current. I’ve compared the reading of the Mooshimeter to the reading of my reference thermometer and the Mooshimeter showed just 0.2°C less than the reference thermometer at 20°C. Nice! According to the online user manual, Shipping mode was never intended to save battery power when the Mooshimeter is not in use. It is simply intended to satisfy world wide shipping companies who don’t fancy shipping live radios. So don’t expect your batteries to last longer when you put your Mooshimeter in Shipping mode when you don’t intend to use it for while. I haven’t measured what the current consumption in disconnected state is versus the current consumption in Shipping mode. I don’t expect huge differences. And the claim is that the batteries last more than a year in disconnected state anyway. While they will last about 50 hours in active state. Don’t expect to be able to measure 50 hours after you’ve had your Moushi meter in offline state for almost a year though. Every week you’ll leave your Mooshimeter inactive will cost you about 1 hour of measuring time (that is why they’ve conveniently put 52 weeks in a year I suppose). Wait a minute, perhaps it does save a considerable amount of battery power when you do put your Mooshimeter into Shipping mode after all. Anyone, with the Mooshimeter App, can find your Mooshimeter and connect to it, and leave it in the active state all the time until it runs out of juice. So even though the user manual says it doesn’t make much difference whether you put your Mooshimeter in Shipping mode or not, I think different. I think it is better to put it in Shipping mode when you don’t intend to use your Mooshimeter for a while. Better still. If you don’t intend to use your Mooshimeter for months in a row it’s even better to remove the batteries all together. Just in case they want to leak some nasty chemicals into your precious Mooshimeter. The nice thing about the Mooshimeter concept is that it is basically all software driven. The meter itself contains firmware, which can be improved. And the App is also just a piece of software. Judging by the screenshots I’ve found on the internet the App has already come a long way to what it is now. Ability to limit the resolution, which will eliminate the nervousness of the displayed values. For instance by swiping the digits of the display left or right. Touch and hold feature. For instance store several values by repeatedly tapping the digits of the display. Auto-hold feature. Measure something in an awkward position and automatically store every stable reading, indicated by a beep of the phone, or by reading the value out loud. Selectable scaling factor, which allows for easier reading of currents measured across an external shunt or by current clamps. The ability to measure external temperatures with PT100 or P1000 sensors. B.T.W. The Mooshimeter App is Open Source and can be found on Github. In case you would like to see extra features in the App, that's the place to ask for them, or better still add them yourself. Alas I'm not an App developer myself. I really like my Mooshimeter, despite of the weaknesses which I’ve found. It opens up measuring opportunities which were never possible with conventional DMMs, especially not those within the same price range as the Mooshimeter. Remember that the Mooshimeter are 2 DMMs in one package. And I’m sure the little issues I’ve found with my Mooshimeter can be ironed out by a firmware update. As long as you make sure you don't overload the Aux input and stick to AC voltages without a DC offset you won't even notice the bugs. Would I recommend the Mooshimeter to others? I most certainly would, and will. But don’t expect the same accuracy as from a €1000 DMM. And don’t get fooled by the difference between accuracy and resolution.